The single most useful tool I have for planning meals and buying household supplies at a reasonable price is the weekly grocery store flyer. It’s an essential tool for me when I’m planning meals, when I’m making grocery lists, and when I’m looking for bargains on items I want. 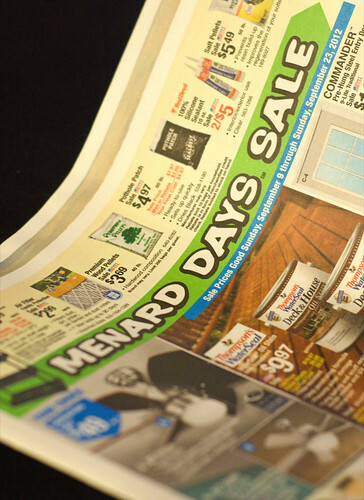 If you want to reduce your grocery store costs, start with the flyers. For the most part, I use the internet to get my grocery store flyers. I typically visit the website of the grocery chains I use the most (namely, Fareway and Hy-Vee) and download the flyers from them. I often download flyers from the big box stores, like Target. This makes it very convenient (since I usually make grocery lists and meal plans while at the computer) and it saves paper. So, how do I use the flyers? The first thing I do is I look for sales on fresh meat and produce. (Although, honestly, I don’t look for meat anymore since I went to a vegetarian diet.) I go through the flyers from the various stores and try to find out which fresh ingredients are on sale this week. Once I have a list of those ingredients, I usually do some recipe searching. I’ll type in pairs of ingredients that are on sale into Google along with the word “recipe.” So, for example, if I see that Brussels sprouts and ricotta cheese are on sale, I’ll type “Brussels sprouts ricotta recipe” into Google and see what pops up. My goal is to get five relatively simple recipes for meals that utilize these foods, which pretty much covers our family meals for a week (along with leftovers). Since the recipes are based on food items that are on sale, they’re naturally going to be relatively low cost (as long as you’re sensible about it). Once I have those meals figured out, I build my grocery list based on those recipes. I cross-check the recipes with what’s in the pantry and freezer so that I only get the items that I need. The end result of this effort? When I go to the store, I have a grocery list that’s pared down to only the things I need and a lot of those items are on sale already. I’ll often head to the checkout to find that my grocery total is surprisingly low. That’s a great frugal feeling to have.